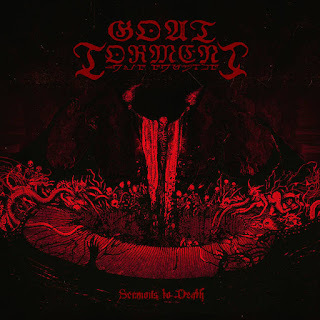 Goat Torment are a band from Belgium that plays a very raw and bestial form of black metal and this is a review of their 2015 album "Sermons To Death" which will be released on July 24th by Armor Fati Productions. A very dark and ritualistic sounding synth starts off the album and after the intro the music goes into a very fast war metal direction along with a great amount of brutal blast beats and a few seconds later bestial black metal screams start to kick in and they also use a great mixture of high pitched and deep screams. All of the musical instruments on the recording have a very powerful sound to them and a lot of the riffs bring in a 90's style of black metal and some of t he songs also bring in a great mixture of slow, mid paced and fast parts along with the slower sections adding in elements of doom metal and when solos and leads are utilized they are done in more of a dark and melodic musical direction while they also bring in the speed of war metal at times. Some of the riffing brings in melodies at times and there are also a couple of tracks that are long and epic in length and they also bring in another ritualistic intro before returning back to a heavier musical direction and there are also some parts present on the recording that brings in a touch of the more dark and evil side of death metal and the last track also mixes in the ritualistic sounds with the heavier parts. Goat Torment takes a musical style that takes a raw and satanic form of black metal and mixes it in with elements of bestial and war metal to create a very heavy and evil sounding recording, the production sounds very powerful while the lyrics cover Satanism, Devil Worship Blasphemous themes. In my opinion Goat Torment are a very great sounding bestial black metal band and if you are a fan of this musical genre, you should check out this album. RECOMMENDED TRACKS INCLUDE "Bones Aligned" "Within The Realm Of Darkness" and "Of Fire And Brimstone" 8/5 out of 10.